The cover story shows how coordinated efforts among community groups and public agencies can reduce gun violence among inner-city youth. Other stories discuss the lessons from state efforts to expand health insurance coverage; the prospects for the United States and Russia to reduce the risk of accidental or unauthorized use of nuclear weapons; the ability of defense policymakers to use a new computer tool to help refine personnel policies; the need for military bases and civilian authorities to establish formal agreements on domestic violence cases; and the growing research and development field of nanotechnology. Various news stories are also included. Tita, George, K. Jack Riley, Greg Ridgeway, Clifford A. Grammich, David E. Mosher, Lowell H. Schwartz, M. Susan Marquis, Stephen H Long, John A. Ausink, Laura J. Hickman, John P. Godges, and Paul S. Steinberg, RAND Review: Vol. 27, No. 3, Fall 2003. 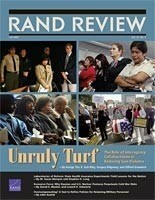 Santa Monica, CA: RAND Corporation, 2003. https://www.rand.org/pubs/corporate_pubs/CP22-2003-12.html.